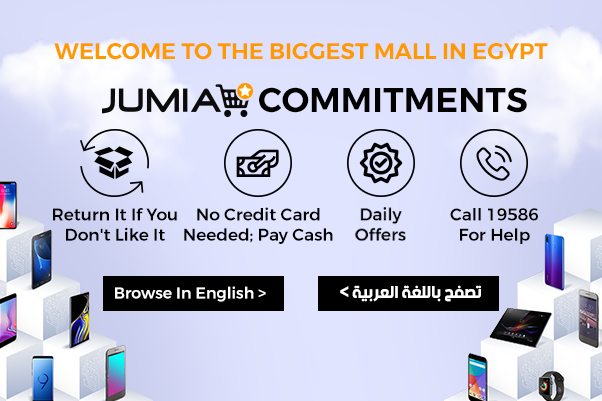 Welcome to eg.Jumia.com website (the "Site"). These terms and conditions ("Terms and Conditions") apply to the Site, and all of its divisions, subsidiaries, and affiliate operated Internet sites which reference these Terms and Conditions. jumia.com.eg is operated by AIH General Merchandise UG (haftungsbeschränkt) & Co. KG ("we"), a company registered in Germany. International Credit Card Payments that you make through the Site will be processed by our contracted Payment Service Provider, a company registered in the Netherlands. In addition to any other legal or equitable remedies, we may, without prior notice to you, immediately terminate the Terms and Conditions or revoke any or all of your rights granted under the Terms and Conditions. Upon any termination of this Agreement, you shall immediately cease all access to and use of the Site and we shall, in addition to any other legal or equitable remedies, immediately revoke all password(s) and account identification issued to you and deny your access to and use of this Site in whole or in part. Any termination of this agreement shall not affect the respective rights and obligations (including without limitation, payment obligations) of the parties arising before the date of termination. You furthermore agree that the Site shall not be liable to you or to any other person as a result of any such suspension or termination. If you are dissatisfied with the Site or with any terms, conditions, rules, policies, guidelines, or practices of AIH General Merchandise UG (haftungsbeschränkt) & Co. KG in operating the Site, your sole and exclusive remedy is to discontinue using the Site. Kindly be informed that ordered items are subject to availability till it last at the time of shipping and are the sole responsibility of the seller with no liability on Jumia Egypt. Your delight is our primary aim. Flash Sale promotional discounts (Flash Sales) are short-time offers of items that may be deeply discounted and of limited availability. Flash Sales may only be applied to one unit of each product (unless otherwise stated). Each Flash Sale is subject to two time restrictions. The first restriction is for the overall Flash Sale and is displayed with the specific Flash Sale. The item must be added to the Cart before this time expires. The second restriction applies after a Flash Sale item has been placed in the Cart and expires after a very limited time. Orders must be placed before the expiration of both time periods. A Flash Sale must be redeemed by checking out through clicking the "Proceed to Checkout" button from your Shopping Cart. A limited quantity of Flash Sales are available per item. If supplies are still available after all of the Flash Sales have been used, customers may purchase the item at its regular Jumia price. Flash Sales are good only for specific products featured. Flash Sales discounts do not apply to shipping or taxes. If you return a product purchased using a Flash Sale, your refund will equal the amount you paid for the product, subject to applicable refund policies.